Eurotard 13696c child, this comfortable flowing pant is made of fabric that does not fray or ravel and can be trimmed at legs with no need to hem. Elastic waistband. 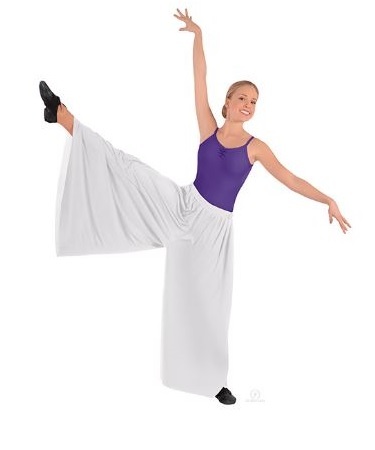 This Plazaoo Pant will add color and dimension to your Praise, Liturgical, Worship, Mime, or Spiritual Dance attire. Shown Eurotard's Long Sleeve Cotton Lycra® Leotard (EU 10265). S/M: (waist that stretches from 19” up to 34”, Length 30" ). L/XL: (waist that stretches from 20” up to 36”, Length 32" ).